1 Heat 1 tablespoon oil in large nonstick skillet over medium-high heat and cook chicken, turning once, 6 minutes. Stir in barbecue sauce; turn chicken to coat. Cook until chicken is thoroughly cooked, about 1 minute. Remove chicken and set aside. 2 Stir water and corn into same skillet and bring to a boil over high heat. 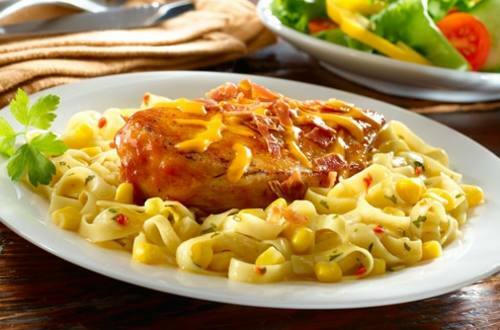 Stir in Knorr® Pasta Sides™ - Chicken flavor and return to a boil. Reduce heat to medium and cook, stirring occasionally, 8 minutes or until pasta is tender. 3 Arrange chicken on pasta, then sprinkle with bacon. Top with cheese. Let stand covered until cheese is melted, about 2 minutes.